The“Imperial city of palace”lies 140kms away from Bangalore. Mysore, the capital city of the Wodeyars has always enchanted its admirers with its quaint charm, rich heritage, imposing buildings, broad shady avenues, sacred temples, excellent climate, beautifully laid out gardens, magnificent palaces and zoo. The earlier name of Mysore was “Mahisur” traces its history back to the mythical past, when Goddess Chamundeshwari of Chamundi hills killed Mahishasura, the wicked buffalo-headed demon. Mysore is well known for the festival Dasara which is celebrated on the victory of good over evil. 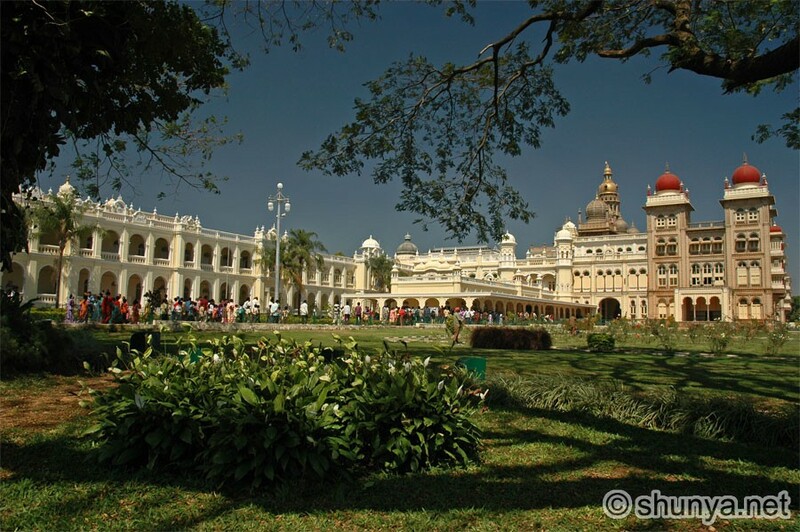 Mysore reached the Zenith of its glory as a fabled centre of oriental splendor during the Wodeyar rule. Mysore is the Second largest city of Karnataka. Mysore is a beautiful city always busy with tourists and visitors. It is well known Globally for its exotic sandalwood and rich silks. It’s grand and imposing palaces, gardens, majestic temples leave an ever-lasting memorable moments and experience to the tourists. The meaning of word Mysore is “Mahishasura” derived from Mahishuru or Mahishasurana Ooru after the demon king Mahishasura, who is believed to be lived here and also even during the time of Mahabharata, the history of Mysore can be traced , later it was ruled by the Ganga Dynasty from the second century to approximately tenth century, followed by Chalukyas, later it was ruled by the Cholas for a century later, Hoysalas, the Vijayanagar empire and finally the Mysore Yadu rules in the thirteenth century. The city is said to have gained prominence during the reign of Chamaraja Wadiyar. For a brief period the Wadiyars got dethroned, but finally returned to power under the British command at the end of the seventeenth century. Mysore has a warm and cool climate throughout the year as it is situated 770m above sea level. Mysore is well known for the festival Dussehra. Dussehra is one of the most important and renowned festival of India. Dasara is observed as State festival in Mysore, which also known as ‘Nadahabba’ because of the special initiation is taken by the Royal family of Mysore in the festival celebrations. It is a ten day festival celebration which ends on Vijayadashmi Dasara day. The day marks the successful ending of the preceding nine days. In the honor of Goddess Saraswathi the first six days are celebrated. Eighth day is dedicated to Goddess Durga and ninth day is for the Goddess of wealth Lakshmi. On the ending day (Tenth day) a grand procession is held from Mysore Palace and terminates at Bannimantap. During the festive season, the entire city is lightened and decorated in a most impressive way, that attracts thousands of tourists to the city. It’s worth sight to see the palace and other important buildings are also embellished and illuminated. Many cultural programs are presented in the Mysore palace, performed by famous artists. Majestic processions, a torch light parade, music and dance events vitalize the placid city. Film festival, Sport events, poets meet, food festival are also held. The famous Dasara Exhibition is organized by the Karnataka Exhibition Authority at Doddakere Maidana where many public and private sector, State government departments and other business class set up their stalls to promote their industries. Traditional wrestling matches and Craft fairs are other highlights of the exhibition. By Air : The nearest airport is Bangalore. There are regular flights to and from Bangalore from several numbers of airlines and nearly all major cities like Delhi, Mumbai, Chennai and Kolkata. By Rail : Mysore is linked by rail to Bangalore and many other cities in South India. Prestigious luxury trains and many other express and mail trains service is there to this station regularly. By Road : A good network of roads connects Mysore to important cities in Karnataka. You can also have the cab facility so that by hiring a cab you can enjoy the beauty of the city more comfortably.